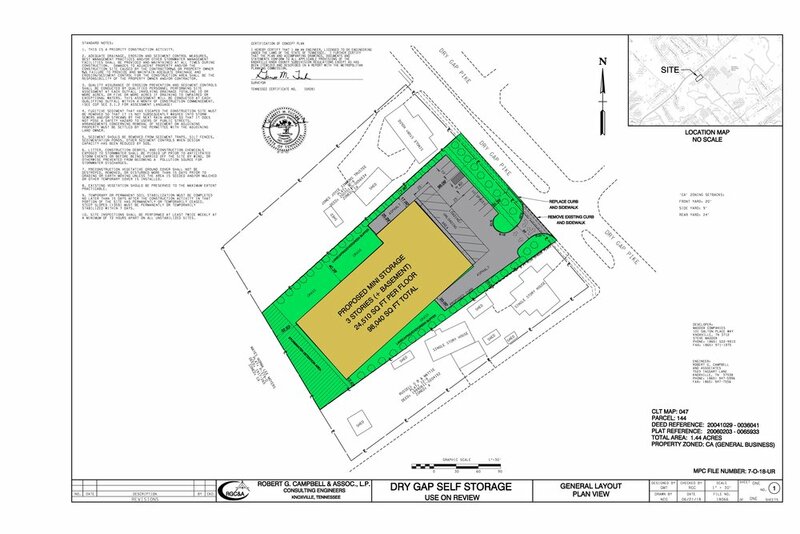 KNOXVILLE, Tenn. - The Metropolitan Planning Commission approved plans for a self-storage facility at Dry Gap Pike and Emory Road to be developed by Maddox Companies. Developer Steve Maddox received unanimous approval to move forward and has plans to complete the development by late 2019. This facility will be 100,000 square feet, stand three stories tall, and be fully climate controlled. 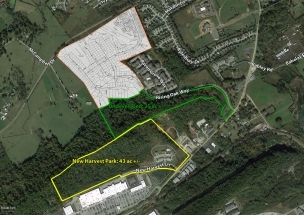 “With the several new housing developments approved in the immediate vicinity of the property, this facility will be a much needed amenity for new and current surrounding residents” Maddox said. Maddox plans for the building to be a low impact use for the property, and be visually pleasing. In addition, the property will be highly secured and have 24 hour access. This Dry Gap self-storage facility is a new style where all units are indoor, and the building exterior has a similar appearance to an upscale retail or office building. KNOXVILLE, Tenn. - Maddox Companies received planning commission approval for an all-indoor storage facility to be built in Northwest Knoxville. The 100,000 square foot facility will be located on Oak Ridge Highway and Schaad Road, and will stand three stories tall. Maddox presented its plans to the planning commission and received unanimous approval of the self-storage development. “We thank the planning commission for their approval and appreciate their support.” said developer Steve Maddox. “This facility will be visually similar to an upscale office,” said Maddox. “It will provide an essential service to the local community.” The site is located in a fast-growing area, with over 1,800 homes approved over the past four years. This self-storage development will be 100,000 square feet, three stories, all-indoor and completely climate controlled. The entire property will be highly secured and monitored at all times. Maddox has plans to have the facility completed by early 2020. (Seminole, Fla) - Crunch Fitness, Optimart and Carepoint Pharmacy have signed leases for spaces in Maddox Companies' newly renovated Twin Oaks Shopping Center in Seminole, Fla.
Crunch Fitness will occupy a new 23,911 square-foot space to be built this fall. Maddox Companies will demolish the prior space anchoring the shopping center, and deliver a new shell in that location to reflect Crunch Fitness' state-of-the-art design. Headquartered in New York City, Crunch serves over 900,000 members with over 180 gyms worldwide in 22 states, Puerto Rico and 4 countries. Crunch is rapidly expanding across the U.S. and around the globe. Opti-mart, a Florida-based chain of eyewear retailers will relocate to Twin Oaks Shopping Center from a nearby center this fall. Chicago-based Carepoint Pharmacy will open its first Florida location in Twin Oaks Shopping Center this fall. The Seminole location will complement Carepoint's operations across Illinois, Georgia, Ohio, Texas and Indiana. These announcements come on the heels of a complete renovation of the property completed by Maddox Companies earlier this year. The 54,097 square-foot property is located at the intersection of US-19A Seminole Boulevard and FL-694 Park Boulevard. The reconfiguration of the anchor space will create an additional 4,900 square-feet of shop spaces for lease in the otherwise fully committed center. This new space can be subdivided to meet a tenant's needs. Parties interested in leasing at Twin Oaks Shopping Center can contact Brandon Clark or Steve Maddox at (865) 522-9910. (Knoxville, Tenn) – Maddox Property Management & Sales, Inc has brokered the sale of Town Creek Commons, a 15,011-square-foot Class A medical office building in Lenoir City, Tenn. MedSouth Lenoir City, LLC was the buyer. Steve Maddox and Brandon Clark represented Seller Town Creek Properties, GP in the transaction. Maddox Companies assisted the Seller in improving the building to full occupancy, and then marketing and soliciting offers for the multi-tenant building. The building was constructed in 2010 and has visibility from Exit 81 of Interstate 75. It is occupied by a mix of national and regional tenants including Smoky Mountain Pediatric Dentistry, Tennova Healthcare Systems, PhysioTherapy, Advanced Endodontics and Tennessee Urology. CLINTON, TN - Maddox Companies has been retained by FHG Enterprises to market the Centre at Fox Run, a 35 acre interstate development in Clinton, TN. The development is anchored by Fox Toyota and a new Weigel's Fuel Center. The site comprises the northeast quadrant of I-75 Exit 122 (TN-61 Charles G. Seivers Boulevard) and is a retail node serving Clinton, TN as well as surrounding Norris Lake development and Anderson, Campbell, Scott, Claiborne and Union Counties, as well as parts of Southern Kentucky. The Centre at Fox Run consists of rough graded interstate-visible sites with access road, project signage and utilities in place. (Knoxville, TN) – Maddox Property Management & Sales, Inc has brokered the sale of 614 Mabry Hood Road Suite 301, a 5,287-square-foot Class A suburban office condominum in Knoxville, TN. Coal Creek Company will relocate its headquarters to the top floor of the building. Steve Maddox and Brandon Clark represented both Buyer and Seller in the transaction. Maddox assisted Functional Pathways, a national leader in contract rehabilitation and therapy management services, in relocating its headquarters from the Waters Edge to a larger suite in its acquisition of 10133 Sherrill Boulevard last year. The Offices at Waters Edge is located 10 miles west of downtown Knoxville at the junction of Interstate 40/75 and Pellissippi Parkway. Other tenants in the Offices at Waters Edge development include Rodefer Moss, EnerNex and Visionary Horizons Wealth Management. (Lenoir City, TN) – Steven K. Maddox & Associates, LLC / Keller Williams Commercial has been retained by Town Creek Properties GP to broker the sale of Town Creek Commons, a Class A Medical Office Building on the campus of Fort Loudoun Medical Center in Lenoir City, TN, a growing bedroom community of Knoxville. The asset was constructed in 2010 and has visibility from Exit 81 of Interstate 75. The building is occupied by Smoky Mountain Pediatric Dentistry, Tennova Healthcare Systems, PhysioTherapy, Advanced Endodontics and Tennessee Urology. The adjoining Fort Loudoun Medical Center is a community acute care hospital providing 24-hour emergency services, critical care and cardiac observation unit, and surgical capabilities. Hospital-based services include outpatient diagnostic testing, radiology, laboratory, physical and cardiac rehabilitation. Physician specialties available in the clinic include cardiology, orthopedics, gastroenterology, urology, oncology and dermatology. FLMC is a facility of Covenant Health, a comprehensive, community-owned health system operating 9 acute care hospitals in East Tennessee. Covenant has over 10,000 employees and over 1,500 affiliated physicians. (Knoxville, TN) – Where others see turmoil, Steven K. Maddox of Maddox Companies sees opportunity in the so-called "Wall of Maturities" looming over the US Commercial Real Estate market in 2016. The term refers to the over $600 billion in CMBS loans orignated between 2005 and 2007, most of which have 10 year maturities. It is expected that anywhere from 20 percent to 50 percent of maturing loans will face difficulties. "Many of these loans are secured by properties for positive cash flows and appreciation. Our firm has the track record to reposition these assets to lease. We have the relationships to get deals done, and the experience and resources for effective due diligence and asset management." said Maddox. Experts predict a multitude of consequences on the horizion as servicers work through the foreclosure process on defaulting loans. While some borrowers may be on the hook due to violation of loan covenants, the opportunities lie with the large number of borrowers holding non-recourse debt at levels that are excessively overlevered based on current asset values. This flood of distressed notes is expected to open up opportunities to buy at distressed prices and reposotion properties for positive cash flow and appreciation. Additionally, traditional capital sources are expected to have limited capacity for the refinance or acqusition of these assets, and will likely have more challenging LTV requirements for borrowers, further compounding the opportunities available to well capitalized buyers. With these factors in mind, Maddox is positioning his firm to prosper as troubled loans and assets become acquisition targets. "Our firm is making strategic investments in the resources and relationships needed to underwrite and acquire fundamentally strong properties in winning locations over the next 36 months." said Maddox. 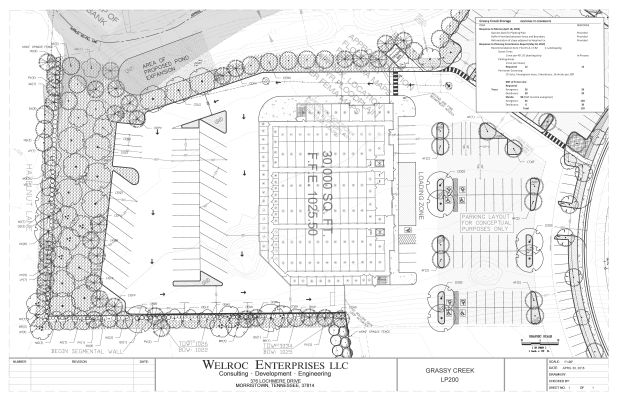 (Knoxville, TN) – Maddox Property Management & Sales, Inc brokered the $3.5 million sale of 9305 Kingston Pike, a 66,511 square-foot former Kroger grocery store in Knoxville, Tenn. Veloce Speedway will open in the building in early 2016. Veloce is a growing chain of European-style indoor go kart centers. Steve Maddox and Brandon Clark represented the Seller, Palo Plesnik of Pacific Palisades, Calif. in the transaction. The former Kroger sits on a 5-acre parcel and anchors Market Place Shopping Center. Market Place has multiple fully-signalized access points and excellent visibility to Kingston Pike. The site is located within 1/4 mile of the Cedar Bluff Road exit of Interstate 40/75, which carries 170,466 vehicles daily. Other major tenants in Market Place include Home Depot, Gabe’s, Planet Fitness, and Tandy Leather. Funding was provided by Spirit Realty Capital. Spirit was represented by Randy Ayers of Crye Leike Commercial. American Development Partners will oversee redevelopment of the facility. Maddox Property Management & Sales, Inc. is an affiliate of Maddox Companies, a leading provider of commercial real estate development, brokerage, leasing, management and construction services.